Do you want to discover some fun new ways to get your kids excited about eating healthy food? Would you like to win an Amazon Gift Card? How about both? Great news… my friends at 5 Minutes For Mom are hosting a Twitter Party on September 14 at 8 pm Eastern about Making Healthy Food Fun For Kids. I’ll be joining the chat as a panelist and I’d love for you to join too. It’s going to be EPIC! The party is sponsored by a new app for kids called HuePets™ that turns daily healthy eating into a game for young children and their families. HuePets™ is a new mobile app for kids that makes nutrition fun and easy to understand. It was created by the nationally-recognized family wellness program HueTrition™. It’s available in both the App store and Google Play. 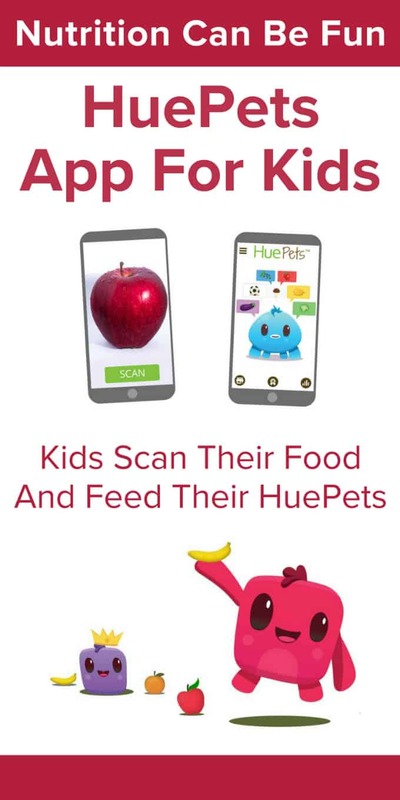 Kids scan real-life meals into the app and then use those to feed their HuePets™. By feeding their HuePets (and themselves) healthy foods, they unlock prizes and raise their pets from little eggs to HueMasters. It’s simple to get started. As a parent, first create a free account at huepets.com and add the names of your kids. Then download the app to your phone or tablet and login. When your kids want to play with their HuePets, they can switch between profiles. This sounds like fun for my daughter to play. I’ve been trying to get her to eat better and I think this app can help me out! 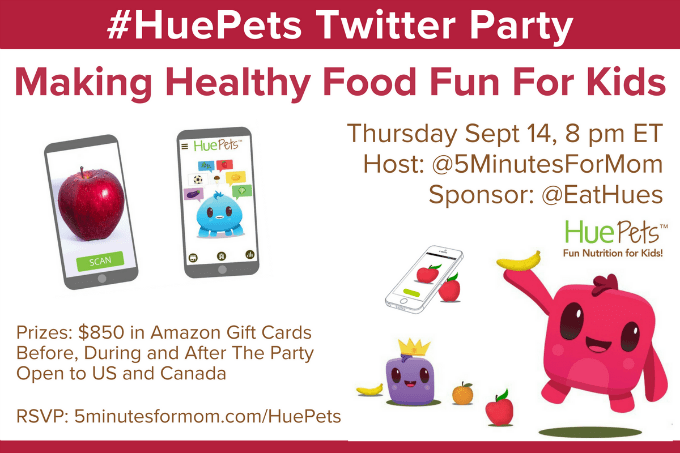 Join the #HuePets twitter party to learn tips for making healthy eating more fun for kids and win prizes. Before, during and after the Twitter Party, 5 Minutes For Mom will be awarding $850 worth of Amazon Gift Cards. Prizing is open to the US and Canada. Canadian winners can choose to receive Amazon.ca gift cards with Canadian currency. 1 Early Bird Prize Winner who RSVPs and tweets about #HuePets. Winner will be selected randomly from the RSVP list and announced at the start of the Twitter Party. If you will be joining the party, RSVP below and Tweet now with #HuePets and you’ll be entered to win the Early Bird Prize of a $100 Amazon Gift Card. You can use the share buttons at the bottom of this post to tweet it out with the hashtag. The form also asks that you include your name and email, but those will not show publicly. By RSVP’ing, you are giving permission to the folks at HueTrition to follow up with you by email. Such a great idea, I’m excited to give this a try!